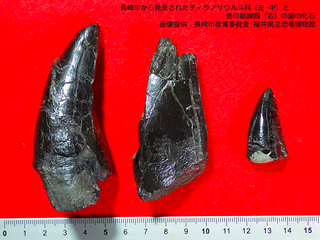 Two fossilized teeth (pictured above, left and center), recovered in Nagasaki, are believed to be from the lower jaw of a ten-meter tyrannosaur that lived some 81-million-years ago. Teeth from smaller tyrannosaurs have been found in Japan before, but this is reportedly the first evidence that so large a predator existed in the area. Contact the author at rtgonzalez@io9.com. Photo Credit: Nagasaki Board of Education/Fukui Dinosaur Museum.